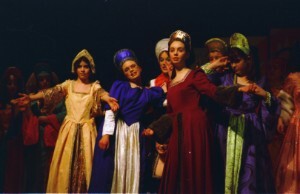 Performed by the Mitchell School of Drama - A brand new production of Shakespeare's play. A brand new production of Shakespeare’s late comedy of love, loss, deception and confusion. Shipwrecked on the shores of a strange land, Viola believes her twin brother Sebastian drowned. Disguising herself as a boy she finds herself a go-between for the man she serves and the woman who refuses to love him. Stories of love, loss and deception collide with the teenage dreams of the mobile and Facebook generation. and song and you have all the ingredients of a rollicking show. A brand new theatre piece, based on Lorna Moon’s life and her short stories. A truly unique production, mingling stories from the collection set in North East Scotland, ‘Doorways in Drumorty’, the amazing life of their author and popular songs from her lifetime. Our take on Homecoming year and all things Scottish, in the style of the nation’s favourite form of entertainment – the television. Fiddles, bagpipes, sheep, castles, whisky, golf, Burns, tatties, tartan, porridge and a look at the life of the ordinary Scot. 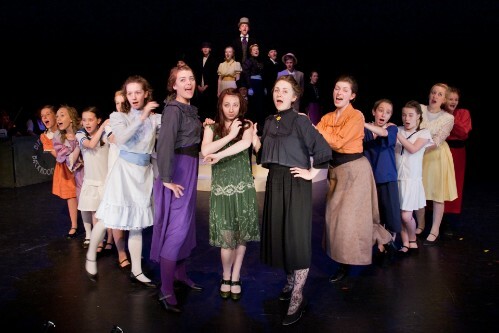 A new production by Garidge Theatre Company and Mitchell School of Drama. 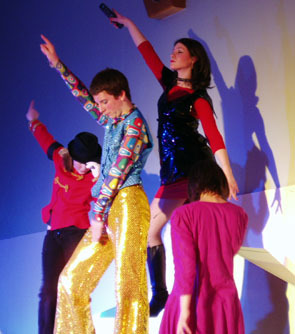 This new and exciting show was for the Garioch Theatre Festival 2008, thanks to funding given by the Young Roots Heritage Lottery Fund. In conjunction with Aberdeenshire Heritage participants have been researching original documents held by Aberdeen Archives. Much of the research has focused on North East poorhouses, uncovering a true story of a young girl born in Peterhead Poorhouse. The company has also been devising with Annie Scott from Aberdeenshire Heritage, taking inspiration for their characters from objects. From the devising a script will be put together by Charles Barron, and original music written by Ashley Forbes. This truly unique and innovative play, under the direction of Rhona Mitchell, could be seen on tour in the North East in June, and then again for Aberdeen International Youth Festival in August. "I have had a most rare vision. I have had a dream, past the wit of man to say what dream it was." Can we always tell the difference between reality and illusion? Which is the real world? Do we choose to dream to escape from reality? Do we turn to reality to escape our dreams? Is it all but a dream? 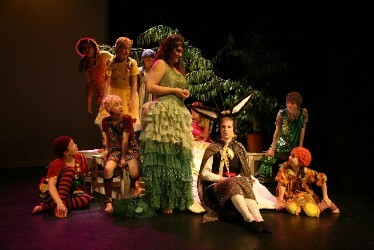 This fresh, new take on 'A Midsummer Night's Dream' is an innovative and exciting youth performance with a strong televisual element. 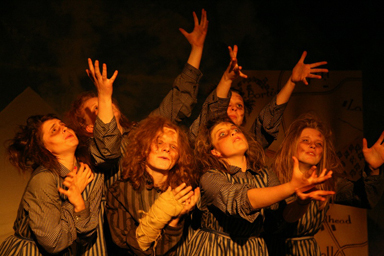 Directed by Rhona Mitchell, working with innovative physical theatre practitioner Al Seed, Artist in Residence at the Arches in Glasgow, the young performers and young film makers will create an original multi media youth theatre performance. This unique commission involves STV and Waste Aware. The production will include audio-visual scenes created with STV, and in an exciting collaboration with Waste Aware Aberdeen we will be creating a waste neutral production. 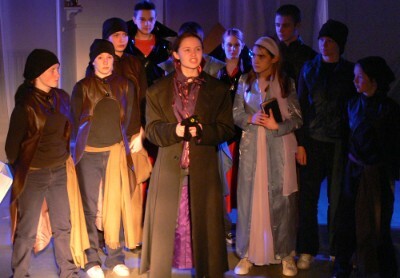 The Aberdeenshire Youth Theatre project offers young people in rural Aberdeenshire the opportunity to work with experienced theatre practitioners to create a youth theatre piece for the Aberdeen International Youth Festival. An innovative new piece devised by the company itself. Let the cast take you on a journey round unknown territory. 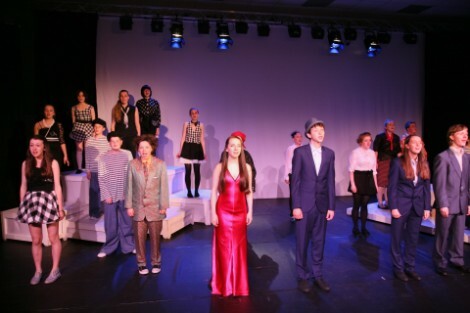 A 'Twelfth Night' with a difference. We are not always what we seem. Confusion, disguises, japes, love, passion and revenge. 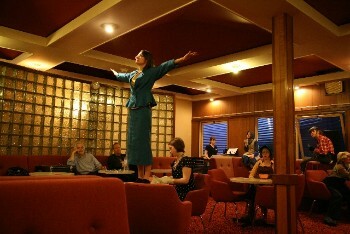 Add in your favourite songs from the 1930's and 1940's and prepare for a lively night. - a brand new show devised by the company! This cast of twenty one 11 - 18 year olds have used their local town, Inverurie, as a starting point for a piece that takes them to a strange new world. The players play a dangerous game - a game they've played already. This game has to end. Join them on their journey through Invergroovie, where helped by Treasure and hindered by Lady Luck, they try to put an end to it before one of them gets lost forever. 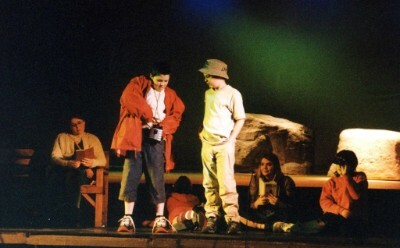 This production consisted of four plays performed in four different venues by four different casts around the theme of Flight as part of the Maiden Stone Inverurie Festival in June 2004. The venues were Mitchell's Dairy - will a family ever make it to the airport? A Secret Garden - who has kidnapped Ladybird Paltrow? A Plane (really a bus) - is the Inverness flight going to take off on time? The West Church where we await the arrival of the bride. 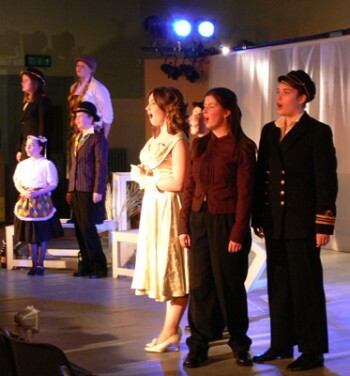 ‘The Eagle has Flown’ was originally commissioned by the Gordon Forum for the Arts and the Mitchell School of Drama are enthusiastic about being given both the opportunity and the challenge to perform this play for the first time. 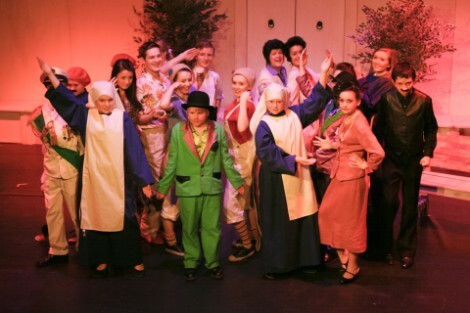 It was written with 100 performers in mind, so it has been quite a challenge to bring it all together with only 32 students (mainly aged between 10 and 18 yrs). 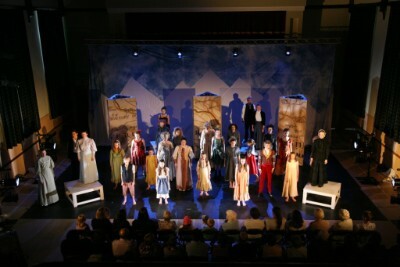 It is a modern day , Doric comedy drama, set on Bennachie and based extremely loosely on the Twelve Labours of Hercules, (or Heracles as he was known in the original Greek.) with numerous sketches that give all members of the company an opportunity to show their capabilities. The Music has been composed by Helen Stewart with arrangements by Ewen Ritchie. 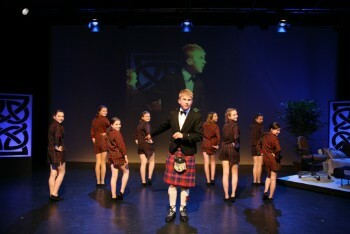 The music includes arrangements for Garioch Junior Fiddlers, young members of the Inverurie Pipe Band and the Levena Taylor School of Dance, all of whom appear in the production. The scenes introduce some diverse characters to the audience, including, the exasperated Guide leader and her mad coven of Brownies, an amorous but stubborn Bull, some Twitchy Birdwatchers, and a bunch of Wild Picts who utilise modern technology to guard Bennachie. There are three characters linking the sketches together, they are Her, Ack and Les. 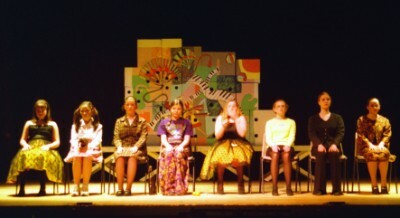 As the play progresses they pick up objects or "tokens" forgotten and left behind by the characters. These tokens are kept and are gathered together at the end of the play in "The Apples". 'Senility' was originally written for MSD in Glasgow, and first performed at the Cottier Theatre in Glasgow's West End in 1996. 'Senility' is very much about 'theatre', in fact it pokes fun at nearly every theatrical form during the course of the play. The evening is rather absurd, and completely ridiculous! As part of the Inverurie Festival MSD offered their audience the chance to be murdered by none other than the legendary serial killers of 19th century Edinburgh, Burke and Hare. 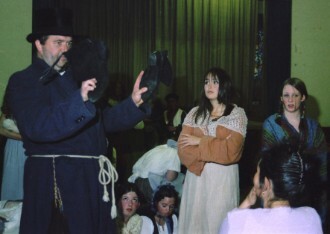 They presented a short piece, mainly devised by the company, which will take place in William Hare’s Lodging House (The West Church Hall); before inviting their audience to join them in the West Church for the trial. 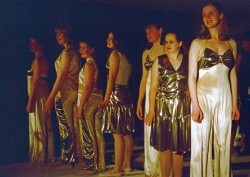 The trial was written for an Edinburgh Fringe show in 1978. 'Outcast' is not straight drama, and certainly not a musical. The only way to describe it is as a piece of theatre. 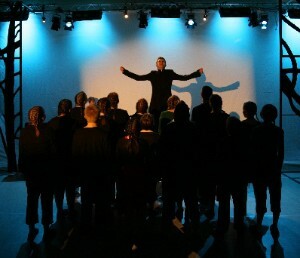 We have concentrated in class on voice, movement and character work; the purpose of the project is to give the students the chance to perform. 'Outcast' is set in 17th century Scotland at the time of the witch hunts. The biblical injunction, 'Thou shalt not suffer a witch to live', (Exodus 22.18) sanctioned widespread persecution. Witchhunts began in Scotland with Mary, Queen of Scots' arrival from France, but became widespread under the reign of her son, James. 'Outcast' follows the persecution of a young girl after an innocent remark. A site specific work written for MSD and performed in the function suite of the Kintore Arms Hotel, Inverurie. The plot, such as it is, centres on preparations for the surprise birthday party for the eponymous Mabel. Nothing is as it seems as the best laid plans go amiss, the wrong performers turn up for the wrong celebration and does Mabel finally get to her party? A fast and furious take on the dark tale of the Prince of Denmark's revenge for his father's murder. involving death, madness, love, revenge and.....well, death. "...so uniformly excellent were the perfomances that it is impossible to pick any one out for distinction"
"...flawless, highly-focused and professional performances - without missing a beat"